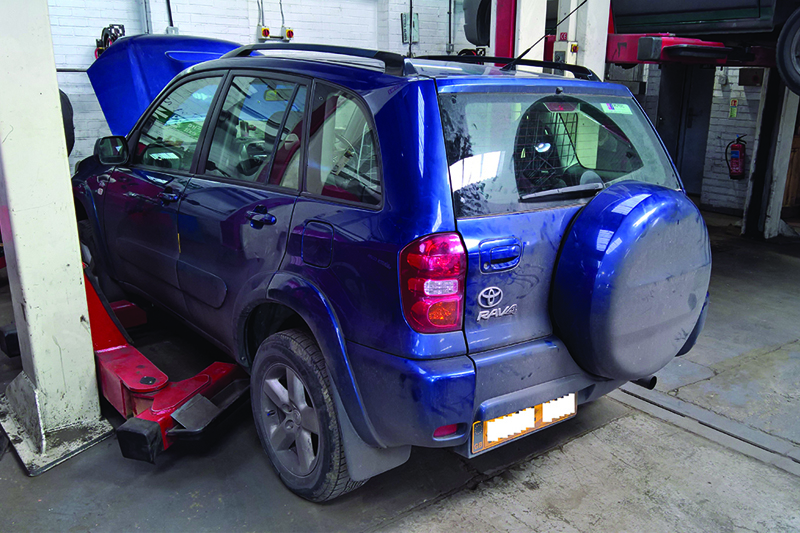 A full clutch replacement guide for a Toyota RAV4 2.0 D4D from the experts at Schaeffler Automotive Aftermarket. 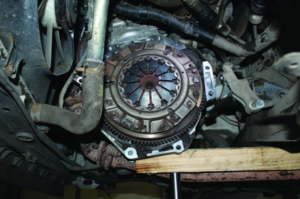 In this month’s article, we are replacing the clutch and Dual Mass Flywheel (DMF) in a Toyota RAV4 2.0 D4D with permanent four-wheel drive, which has covered more than 130,000 miles. The customer reported that the clutch slips under full load, which a quick road test confirmed, and clutch replacement was advised. Toyota released the first generation RAV4 in 1994 – RAV standing for Recreational Active Vehicle. Design features included increased interior room, higher visibility and the option of permanent four-wheel drive, along with good manoeuvrability and good fuel economy, all in a compact vehicle. Toyota’s current RAV4 is the fourth generation. The RAV4 is available in short or long wheelbase with petrol or diesel engines, in either two-wheel drive or permanent four- wheel drive, and it also shares the same platform as the Toyota Carina and Corolla. For this repair, we used the following workshop equipment: a two-post ramp and two transmission jacks. If the vehicle is equipped with locking wheel bolts, ensure you have the key/tool prior to starting the repair. 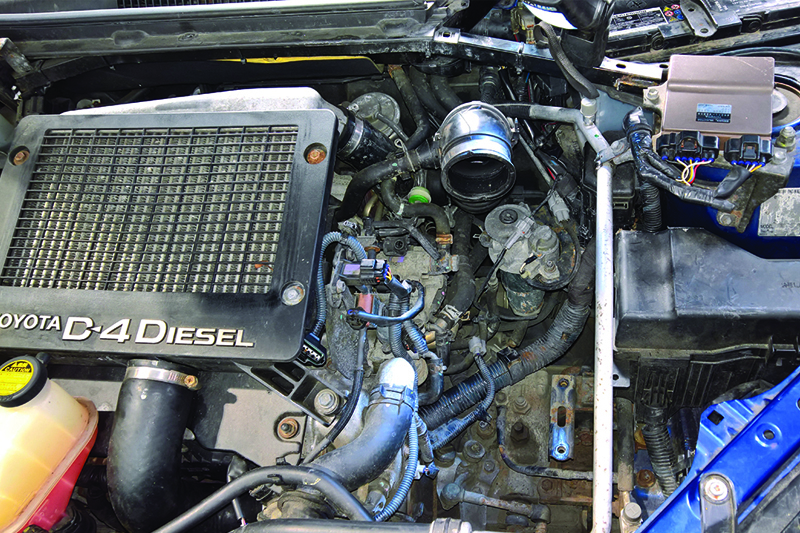 With the vehicle placed on the ramp, disconnect the battery, then disconnect the multiplug from the air flow meter and remove the complete air filter assembly (see below) and disconnect the reverse light switch multiplug and the gearbox earth cable. 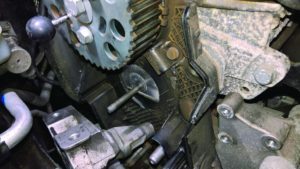 Now remove the gear linkage assembly and then unbolt the clutch slave cylinder that is located on the front of the gearbox, retained by 2 x 13mm nuts, and stow safely (the hydraulics do not have to be disconnected). You’ll also need to remove the plate that is mounted with the slave cylinder. At this point, we can remove the top bell housing bolts and then slacken the top gearbox mounting ready for removal later. With the vehicle on the floor, slacken the wheel bolts and the O/S/F hub nut, raise the ramp to waist height and remove both front wheels, the O/S/F hub nut, the N/S/F wheel arch splash guard (see below) and the N/S/F under tray. Raise the vehicle. Now we need to remove the front sub-frame, so disconnect the anti- roll bar clamps, remove the front gearbox mounting, disconnect both bottom ball joints, and take out the two bolts that hold the steering rack to the front sub-frame (see below) and secure the steering rack to the engine bay to hold in place. Support the front sub-frame with a transmission jack and remove the sub- frame retaining bolts, lower the transmission jack and remove the front sub-frame (see below) and then remove the gearbox cross member/cradle. Now drain the oil out of the gearbox and transfer box and, once the oil has drained, remove the O/S/F driveshaft by sliding out of the transfer box and store in a safe and clean area (see below). 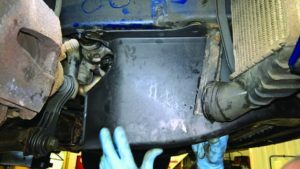 It is advisable to plug the driveshaft holes when the driveshafts have been removed, to stop any excess oil dripping and to stop anything going into the transfer box, then the support bracket for the transfer box to the engine can be removed (see below). The engine and gearbox can now be eased forward to release the front prop shaft joint from the transfer box. Next, pull the bottom of the N/S/F strut assembly outwards which will release the N/S/F driveshaft from the transfer box and the driveshaft can then be positioned conveniently. From under the vehicle, we can now remove the gear linkage bracket and the speedo cable, which are located towards the top rear of the gearbox. Disconnect the starter motor from the front of the engine and leave in position. Support the engine using an engine brace or transmission jack, from the top, and disconnect the top gearbox mounting from the gearbox. Now remove the remaining bell housing bolts, leaving one to hold the gearbox in position. Support the gearbox with a transmission jack and cradle, remove the final bell housing bolt and ease the gearbox away from the engine. You might find that the gearbox has seized on the dowels, so if this is the case, work the gearbox up and down until it has released from the dowels and then remove the gearbox (see below). 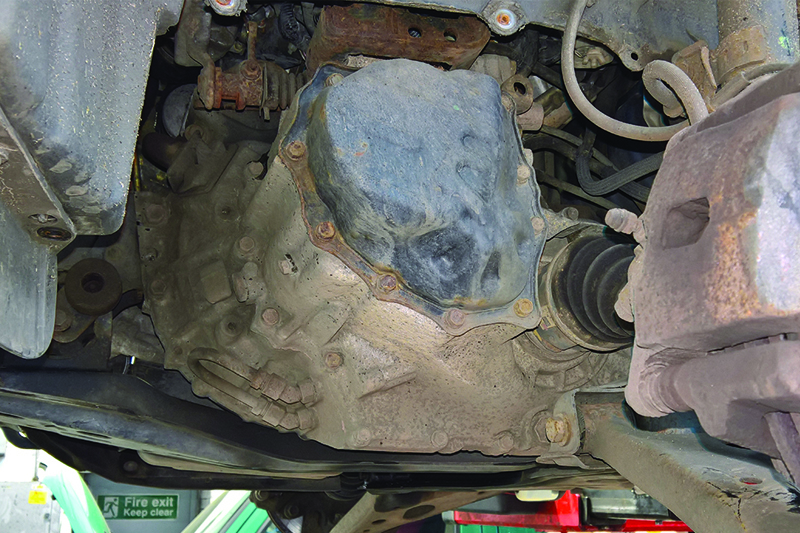 With the clutch now accessible, it was removed and inspected, with evidence that it had reached the end of its service life and that ‘slipping’ had taken place. The customer also requested that the DMF be replaced at the same time. 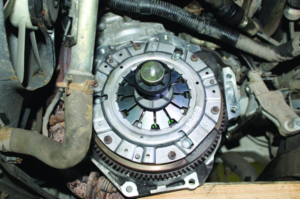 With the clutch and flywheel removed, clean the back of the engine to remove any clutch dust that could contaminate the new clutch and flywheel assembly, check all parts are correct and then fit the new flywheel. 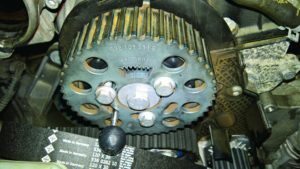 With the flywheel torqued, clean the bell housing of the gearbox and clean and check all moving parts and pivot points for wear, and replace if required. Apply a small amount of high melting point grease to pivot points and contact areas and re-assemble removing any excess grease. Install the new release bearing (see below), then lightly lubricate the gearbox input shaft splines with high melting point grease and slide the new clutch plate onto the input shaft to evenly distribute the grease, and to ensure the clutch plate is correct, wipe off any excess grease. Fit the new clutch to the flywheel using a clutch alignment tool, ensuring the clutch plate is positioned correctly with ‘Gearbox Side’ or ‘Getriebe Seite’ facing the gearbox and then tighten the clutch bolts in an even and sequential manner and torque to the manufacturer’s specification (see below). 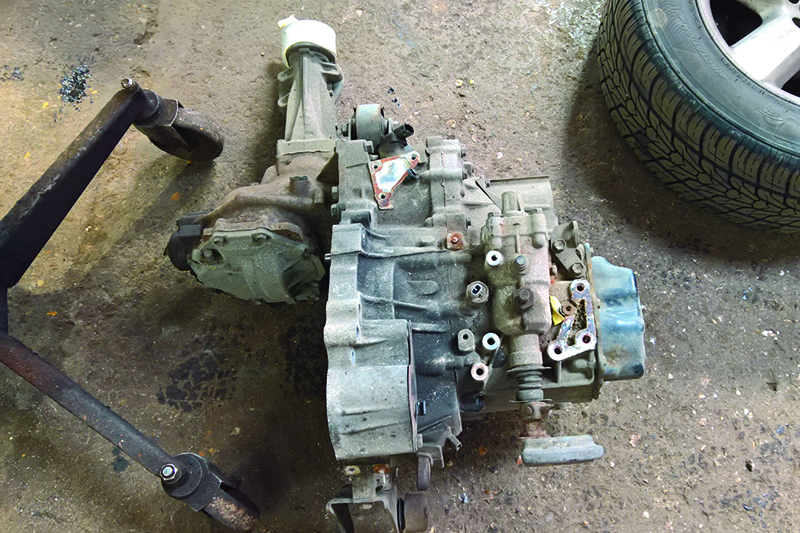 Re-fit the gearbox in reverse order of removal, refill the gearbox and transfer box with the correct quantity and specification of oil and, after connecting the battery, reset all electrical items as required and carry out a road test to ensure the repair is complete. Replacing a water pump requires a fair amount of technical expertise. Are you planning on installing a new water pump? These do’s and don’ts will help you avoid 9 common mistakes. It is possible that there’s a visual difference between the new water pump you’re about to install and the old pump you have just removed. Perhaps the new one has a metal paddle wheel while the old one had a plastic paddle wheel, or perhaps its shape is somewhat different. Don’t worry about these minor differences; all that matters is the position of the water pump pulley. It should be at the same height as in the old pump because – if the belt starts rubbing against the pulley – it will become frayed. To check if you’re good to go, simply put both water pumps on your workbench, face down (i.e. with the side that touches the engine), and compare the position of the pulley. Not flushing the cooling system is a common mistake that could cost you dearly. After all, the old coolant is likely to be contaminated, and its impurities could settle where the dynamic seal is supposed to form. As a result, these impurities will cause scratches on the dynamic seal surface, which could, in turn, lead to premature pump failure. To remove all the debris from the cooling system, flushing is key. A hose and a standard cleansing agent might do, but using a flush tool like the Gates Power Clean Flush tool will help you to do the job properly. Tip: if you flush the cooling system with a water pump attached, use the old water pump and not the new one, to prevent impurities from contaminating the new pump. When changing a water pump, replace all old gaskets and seals with new ones. If your new pump comes with a seal, make sure it’s in impeccable condition before installing it. (Some seals are so thin you could easily damage them when you rip off the packaging.) Perhaps you’re tempted to apply sealant to an O-ring or a dry seal, just to be ‘extra safe’, but these seals don’t need sealant! If your rubber ring won’t stay put, just use a drop of coolant or oil instead. Only apply sealant if the vehicle manufacturer recommends it, and don’t use too much of it. Put a thin, even bead along the edge and wipe off the excess before mounting the water pump. If you do this after you’ve mounted the water pump, you won’t be able to see the excess sealant on the inside, where it will damage the cooling system. The sealant will clump together into chunks that contaminate the coolant and can cause leakage or do terrible damage to the thermostat. Only apply sealant if the vehicle manufacturer recommends it, and when sealant is prescribed, be sure to use in the correct way. … to use the kind recommended by the vehicle manufacturer (don’t start mixing coolants either, because they might counteract each other). … to get the proportions right. If you add too little antifreeze, your cooling system is more likely to freeze, but adding too much might also be harmful. We recommend a fifty-fifty mix of water and antifreeze (make that 65% antifreeze and 35% water for Alpine-cold or Siberian climates). … to mix in warm water with your antifreeze – as odd as that may sound. 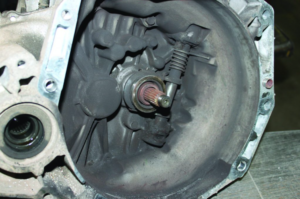 Adding cold coolant to a heated engine can cause thermal shock and damage the seal, even in a new water pump. … to use distilled, deionized or even bottled water, but never tap water. Regular tap water can be very hard, leaving mineral deposits inside the radiator, heater core and engine block. When these deposits break off, they can damage the water pump seal. A lot of mechanics stick to the following procedure: replace the water pump, tighten the bolts, install the belt, tighten the tensioner, refill the cooling system … and start the engine (or just rev it up). But coolant takes a little time to get everywhere it’s supposed to be, so the water pump runs dry for a few seconds. This ruins the seal and heightens the risk of premature leaks or a noisy water pump. Instead we’d advise you to ease the car down after you’ve installed a new water pump, refill the cooling system, lift the car back up and manually rotate the pump about ten times, all the while making sure it rotates freely. Due to this rotating movement, coolant gets sucked into the mechanical seal component, effectively creating a film, which keeps coolant from spilling out. Every mechanically driven water pump has a weep hole that might leak a little in the beginning. Some seepage from the weep hole is completely normal with a new water pump: a mechanical seal has a break-in period of about ten minutes (meaning that it takes about ten minutes of operation for the seal to properly seal itself). However, if you still see seepage a few days after you’ve replaced the pump, or if you notice more pronounced seepage or even drips from the weep hole, you do have a problem: these symptoms point to a faulty installation. When you’re done replacing a water pump, it’s good practice to burp the cooling system to get rid of all the trapped air. Some thermostats have a small hole at 12 o’clock, and a jiggle pin which allows the air to escape (while preventing new air from getting in). It is crucial to inspect the belt drive system that is driving the water pump, while you’re at it. A bad belt and tensioner cause premature bearing and shaft failure and drastically reduce pump life. 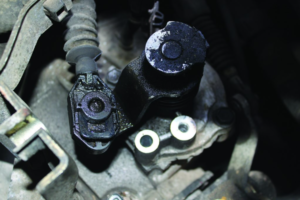 Conversely, a leaking water pump inevitably affects the belt and tensioner. That’s why we recommend changing the water pump, belt and other drive components all at the same time. Our timing belt kits and accessory belt kits include water pumps or even water pumps and thermostats. Coolant contains anti-rust agents, corrosion inhibitors and lubricants for the water pump, yet these components deteriorate over time. 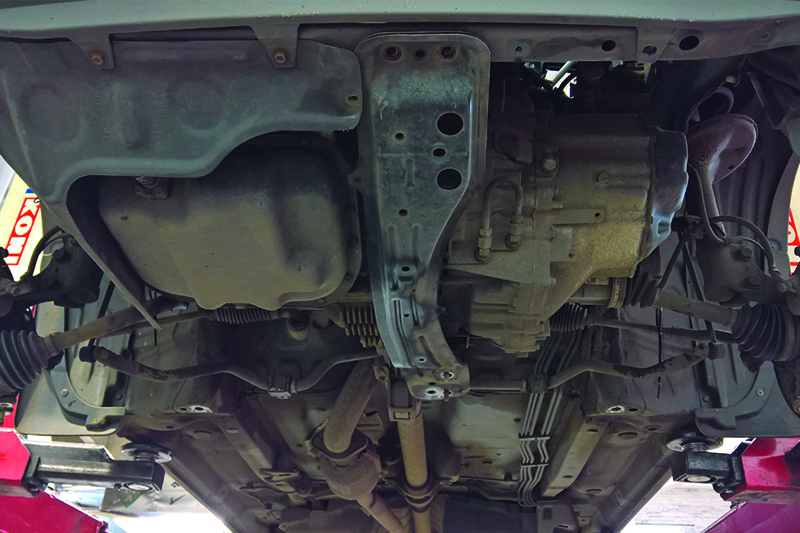 Our rule of thumb: change the coolant every five years to preclude cavitation problems. 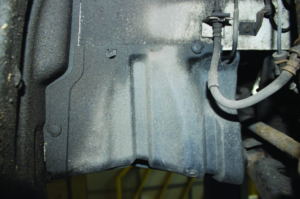 After all, coolant tends to become more acidic over time, increasing the risk of cavitation – a bizarre phenomenon in which what seem like tiny ‘air bubbles’ pop and damage the paddle wheel and other components. (These ‘air bubbles’ actually contain super-hot vapour that can crack plastic and erode metal if it implodes). You cannot see the cavitation bubbles, but engine overheating and weep hole leaks are tell-tale signs. This is due to the presence of a “rebound spring”. 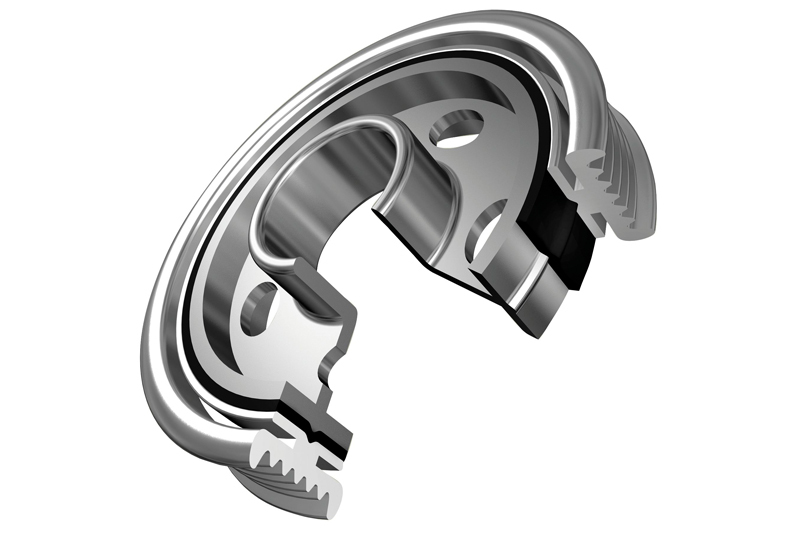 During the first mass production phase of a car, OE struts will often contain a rebound spring. It is at this point that the KYB aftermarket shocks are released, exactly matching this initial design. After the initial mass production phase, some vehicle manufacturers are known to remove the rebound spring to reduce cost. This means when comparing a new OE unit with a KYB unit, there will be a noticeable distance in piston rod length- sometimes by up to 50mm. This can also be the case when comparing a KYB unit with a cheaper brand unit which does not contain a performance enhancing rebound spring. It is worth noting the length of the piston has no effect on the ride height of the vehicle, this is determined by the height of the spring seat. It is a metal spring placed around the base of the piston rod inside the body of the shock absorber. The purpose of the rebound spring is to protect against potential damage from full extension of the piston rod. This also adds stability on cornering, and adds extra resistance during moments of heightened body roll, increasing comfort and safety. The presence of the rebound spring makes it almost impossible to manually fully extend the piston rod from out of the body of the shock absorber. This is why there is a noticeable difference between units with and those without. On some applications, it is necessary to raise the axle or suspension slightly to attach the shock absorber mountings. This can be done either with a drive on ramp or by raising the lower control arm / axle so that it is not fully extended. There are also tools on the market to assist with fitting shock absorbers that have a rebound spring. They compress the internal rebound spring sufficiently to be able to extend the piston rod to the required length to be able to thread the upper nut correctly. When you replace the strut mount, you must check the shape of the piston rod. 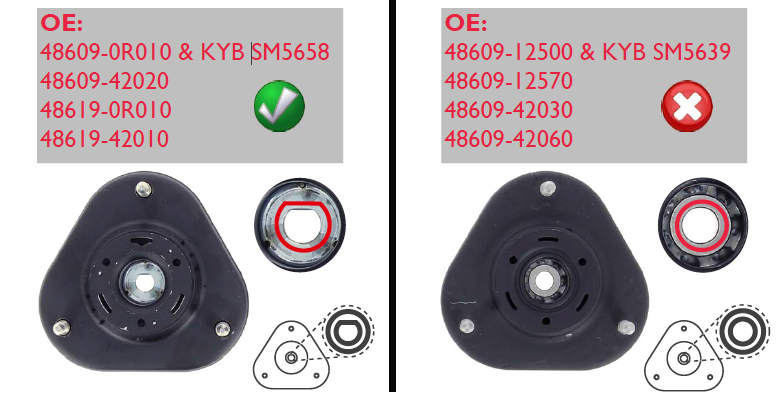 KYB shock absorbers 339031/32 have a flat surface and the strut mount must reflect this. These flat surfaces lock the piston rod in the installation position, allowing you to tighten or remove the nut. So, if you use the wrong strut mount, you are not able to assemble the parts correctly. 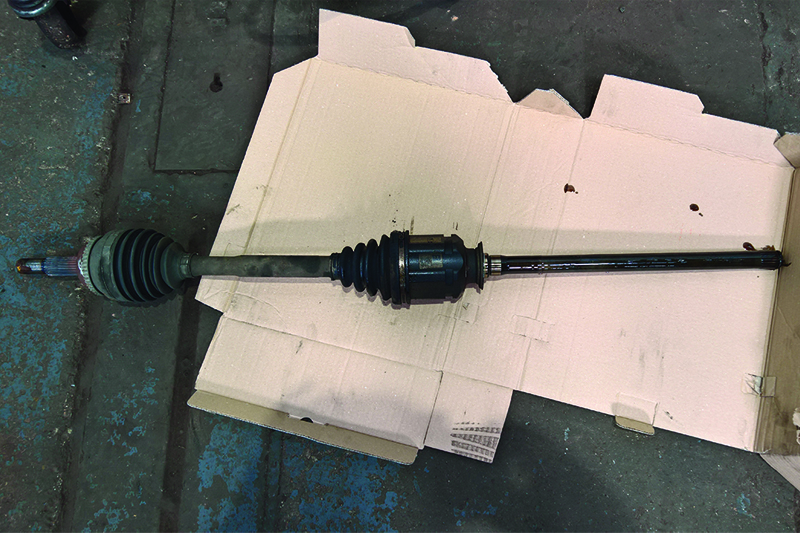 Following a fitting test, KYB has found that this shock absorber must be fitted with the serrated surface against the car body – otherwise you may hear noise whilst driving. 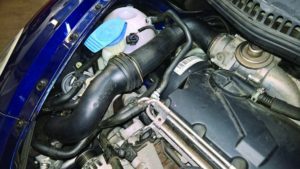 In this month’s article, Schaeffler replace the timing belt and water pump on a 2008 Volkswagen Beetle 1.9 TDI (BSW engine) that has covered just over 66,000 miles. Volkswagen released the new Beetle in 1997. Prior to that, two concept cars had been designed and a strong demand had been noticed for a new Beetle, which went into production and was based on a Golf platform. Assembly took place in Mexico and it was available in petrol and diesel, with two body types; coupe and convertible. 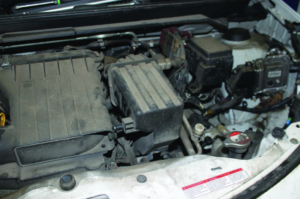 This engine has been identified as an interference type, so in the event of a timing belt failure, the likelihood of engine damage is extremely high. 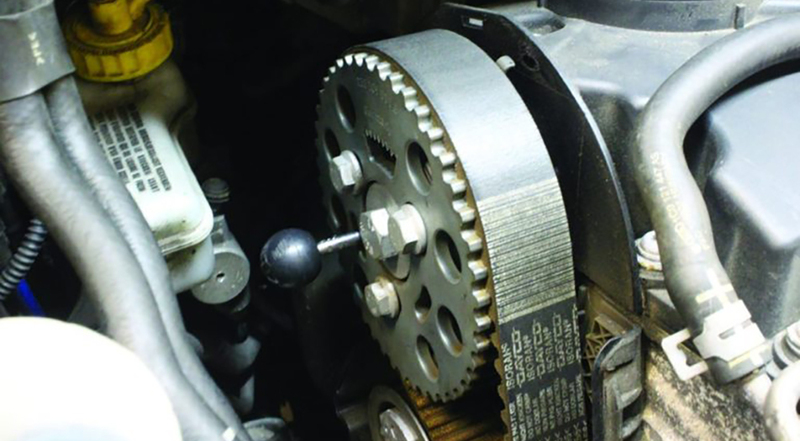 It is always important to install a new timing belt system on an engine at ambient room temperature. Always adhere to turning the engine in direction of rotation unless otherwise advised by the installation instructions. Recommended torque values should always be used. It is also recommended that all the tensioners, idlers and fixings are replaced at the same time as the timing belt. For safety reasons, it is best practice to disconnect the battery earth lead. The vehicle may also be fitted with locking wheel bolts, so make sure the key is available before starting the repair. For this repair, the workshop equipment used was a two-post ramp, crank and camshaft locking tools, two pin tensioner wrench, engine support and a stud extractor. All workshop repair information and repair times are available from www.repxpert.co.uk. With the vehicle placed on the ramp, start by removing the engine cover, then remove the top intercooler hose, coolant expansion tank, fuel filter and fuel filter mounting bracket (see below). Remove the tension from the auxiliary drive belt and lock the tensioner with a pin (see below), remove the auxiliary drive belt, check the auxiliary drive belt for wear and cracking/perishing and replace if required. 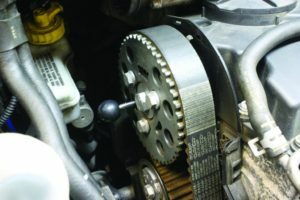 Also, check the Over Running Alternator Pulley (OAP) for correct operation and then remove the auxiliary belt tensioner. Raise the ramp, remove the o/s/f wheel, the lower intercooler hose, the engine under tray and then the o/s/f wheel arch liner, o/s lower engine cover (see below), and lastly remove the metal mounting bracket and the crankshaft front pulley. At this point, we need to support the engine as the engine mounting needs to be removed. This can be done with either an engine brace beam, a support that is located on the front sub-frame or, in this instance, we supported the engine with an axle stand, as most of the work is carried out from above. 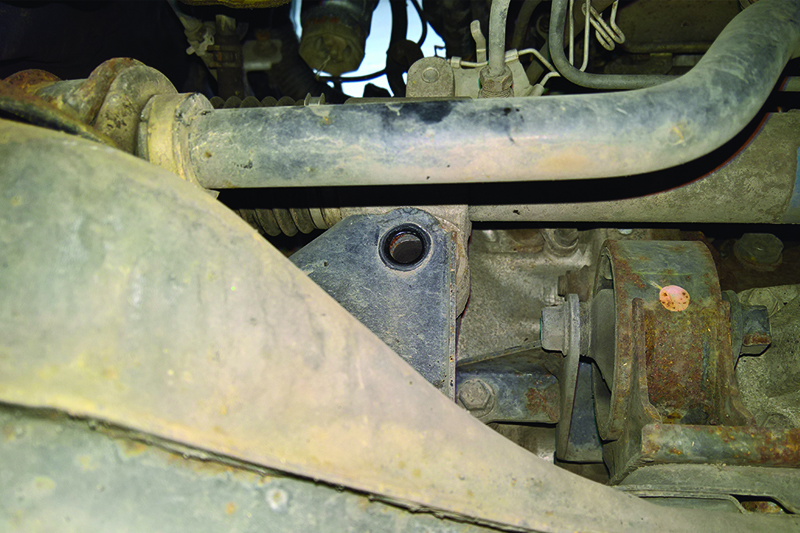 Support the engine, then remove the engine mount and disconnect the mounting bracket from the engine block. This cannot be removed as there is not enough clearance, but can be manoeuvred to allow belt replacement. Now remove the upper timing belt cover, and then with access through the o/s/f wheel arch, take off the two lower timing belt covers, rotate the engine in a clockwise direction and align the timing marks. Then insert locking tools into the crankshaft (see below), and the camshaft (see below). 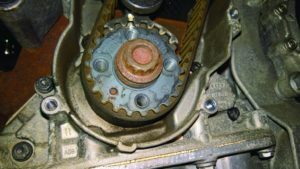 Once the cam and crank have been locked, slacken the tensioner nut, remove the tension from the belt and then take out the timing belt and the tensioner. A crucial point of this repair is to replace the studs for the tensioner and the idler (see below). They were removed easily with a socket type stud extractor and replaced and torqued with the same stud tool (the torque procedure of these studs is very important, so always refer to the latest information). 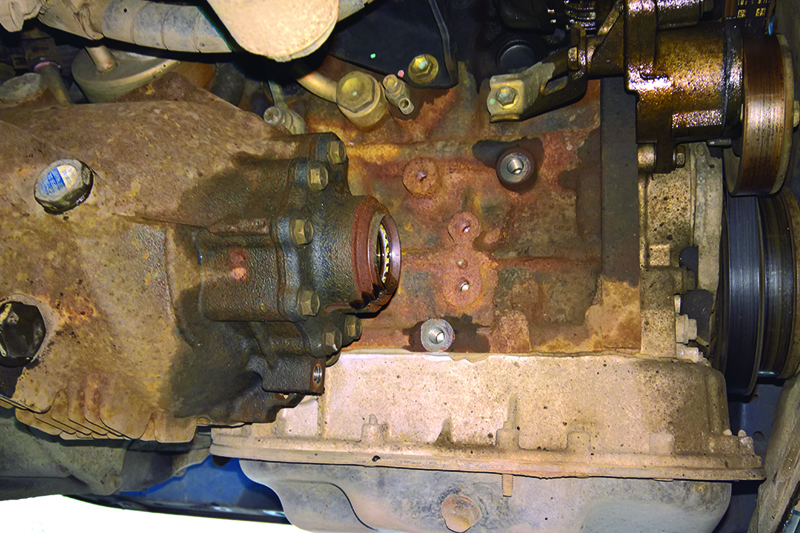 Now take out the water pump by removing the three retaining bolts and easing the pump out of the engine block, and then drain the engine coolant into a tray placed under the vehicle. Once drained, ensure the mounting and sealing faces for the pump are clean and dry, install the new water pump and tighten to the manufacturer’s specification. Remove and dry any remaining coolant in the timing belt area and fit the new idler and tensioner. 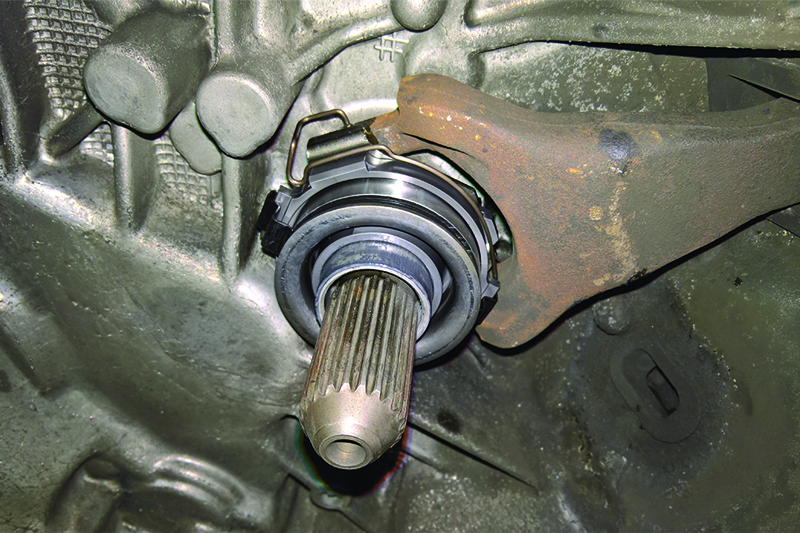 Using a counter-hold tool, slacken the three retaining bolts on the camshaft pulley and rotate the camshaft pulley in a clockwise direction until it is against its stops (see below). Now fit the new timing belt, starting on the crank pulley, then the idler, tensioner, camshaft pulley, and finishing off at the water pump. Gates look at reducing the risk of premature drive system failure. Torsional Vibration Dampers (TVDs) are crankshaft pulleys that protect components in accessory drive systems. They take out the NVH (noise vibration hardness) generated by the crankshaft. The pulleys achieve this thanks to rubber elements that connect the two main metal parts (Fig 1). The rubber is a damping agent, designed to absorb most of the vibrations. That’s why Gates encourages mechanics to install belt kits that include TVDs. Absorption of vibrations eventually causes TVD wear and sometimes misalignment. As well as providing less protection for other components, worn TVDs generate vibrations of their own. These excessive vibrations and noises are often misdiagnosed as problems caused by multi-ribbed belts. Drive system components that are installed together should be replaced at the same time. The best way to optimise performance and maximise protection for all drive system components is to install a TVD as part of a belt kit. 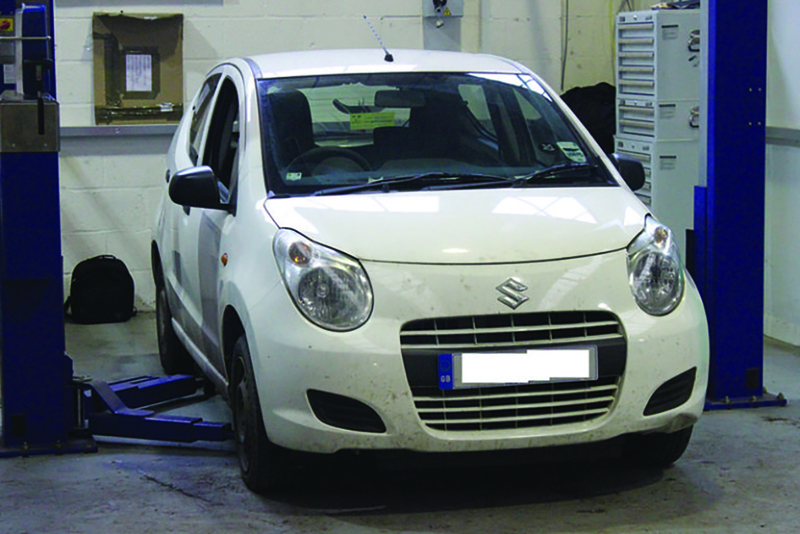 This month’s article documents a clutch replacement in a 2010 Suzuki Alto, fitted with a 1.0L, three-cylinder K10B engine, which has covered more than 70,000 miles. The customer reported clutch slip, which was confirmed by a short road test, and clutch replacement was advised. The Suzuki Alto is quite a popular car on today’s roads – its initial cost being relatively low and with a good return on fuel. Suzuki launched the Alto in 1979 and it has been on the UK roads since 1981. The latest Suzuki Alto is the eighth generation. When opening the bonnet and carrying out an initial inspection, working space is at a premium, but with a little guidance, this is a good repair for any garage with a book time of 5.1 hours. 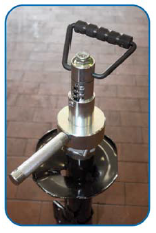 For this fix we used the following workshop equipment: a two-post ramp and a transmission jack. With the car placed on the ramp, starting in the engine bay, disconnect and remove the battery, battery case and battery carrier. The wiring loom retaining clips need to be unclipped from the battery carrier when removing. Now remove the air box/induction noise damper (see below) allowing more access to the gearbox and bell housing area. Slacken the clutch cable and then remove the cable from the clutch release arm, open the plastic retaining clip to release the cable and then slide the outer cable away from the support bracket (light lubrication may help the rubber slide out of the bracket) and stow in the bulkhead area. Remove the clutch cable support bracket as this gives a little extra room. Disconnect the reverse light switch multiplug and stow the loom in the inner wing. Disconnect the gear change cables from the selector mechanism by removing the ‘U clip’ from the front cable (see below) and then detaching from the ball pivot. Disconnect the rear cable by removing the bolts from the pivot point bracket and removing the assembly (note – there is a small nylon bush located in this assembly that can fall out). Slide the outer cables upwards and out of their support bracket and stow in the bulkhead area, then disconnect the gearbox earth wire and bracket. Now remove the upper bell housing bolts whilst the vehicle is on the ground and the bolts are easily accessible, storing in order and location. Next, slacken both driveshaft hub nuts and raise the vehicle to waist height. Remove both front wheels and hub nuts and the plastic shield in the N/S/F wheel arch area (see below), raise the vehicle to access the underside, drain the gearbox oil and then remove the locking pins from both bottom ball joint nuts and then take out the nuts and release both bottom ball joints. Both driveshafts can then be released from the respective hubs. 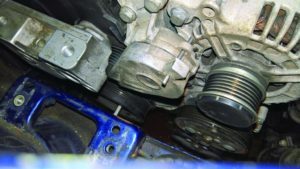 Then, using a lever, ‘snap’ the inner driveshaft joints out of the gearbox, as these are retained by spring-loaded retaining rings, and remove the driveshafts and stow safely. Now take out the rear gearbox mount which is done by releasing the mounting from the bracket, and then the bracket from the gearbox – it is worth mentioning that the mounting and the bracket cannot be fully removed, but moved to give enough room to work. Remove the rear bell housing bolts, which are now accessible, and support the engine (we used a transmission jack in this instance) close to the bell housing area. Next, remove both the front gearbox mounting and the mounting bracket from the gearbox, lower the transmission jack about 50mm to aid gearbox removal and remove the final bell housing bolts. The gearbox can now be taken from the vehicle, either by lifting it out by hand or using a second transmission jack. With the gearbox gone (see below), the clutch can be removed from the flywheel and, as suspected, the clutch had been worn out. This vehicle is fitted with a solid flywheel, so inspect for any damage or heat cracks, confirm the flywheel is serviceable and remove the glaze from the flywheel face with some Emory cloth and clean the flywheel area with some clutch and brake dust cleaner. Finally, remove the release bearing from the release arm in the bell housing. At this point we noticed that the release fork/arm had restricted movement due to the build-up of clutch dust at the pivot points and would not return to its rest position (see below), so we cleaned out the area with clutch and brake dust cleaner, and inspected the release system for any wear and carried out a check for correct and full operation (see below). Fit the new release bearing, applying a very small amount of high melting point grease to the pivot areas as these are all metal. 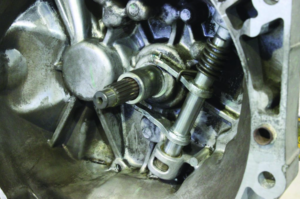 Apply a small amount of high melting point grease to the gearbox input shaft splines, then mount the clutch plate, confirming its correct position, and remove the clutch plate, wiping off any excess grease. 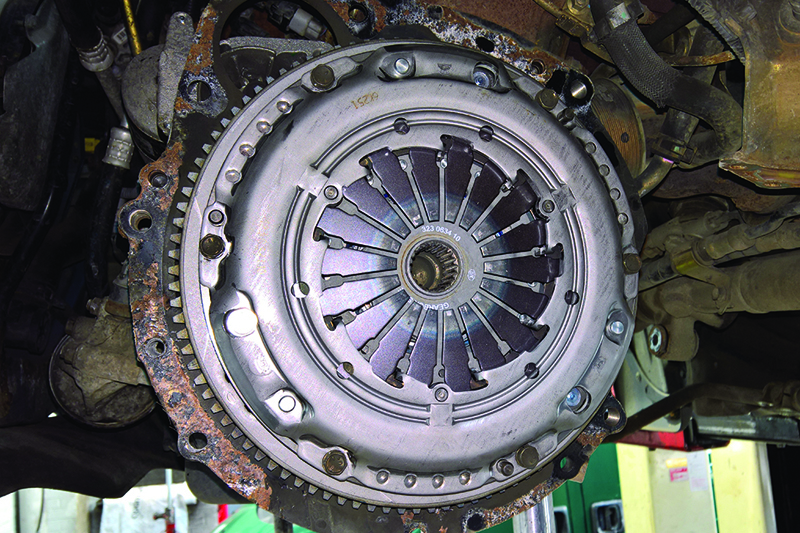 Now mount the new clutch assembly onto the flywheel (see below) using a clutch alignment tool, ensuring the clutch plate is installed correctly so that the ‘Gearbox side’, or ‘Getriebe Seite’, markings on the clutch plate are facing the gearbox, tightening and torqueing the bolts evenly and sequentially. Re-fit the gearbox in reverse order of removal and refill the gearbox with oil. Before fitting the clutch cable, check the cable for free operation and when adjusting always remember to leave a little free play at the top of the pedal to ensure a full release. Once the repair is complete, carry out a road test to ensure the clutch and gear change operation is correct and that all electrical items have been reset after re-connecting the battery. Bosch outlines some simple ways to get the best value from your diagnostic equipment. We all know new features in vehicles are making repairs more complicated, from parking cameras and keyless entry, to broader changes designed to respond to tighter emissions regulations and greater connectivity, all requiring greater levels of expertise. Some vehicles now have more than 100 different Engine Control Units (ECUs) to look after different systems in the car, posing a problem for technicians trying to find and fix faults. Diagnostic equipment can save valuable time, pinpointing faults rather than technicians wasting time diagnosing by substitution. A diagnostic device can also provide proof to the customer that the problem, which brought the vehicle into the workshop, is now solved. For those who have invested in equipment, it may seem like obvious advice to get the most from it, but some technicians are still not fully aware of the commercial benefits presented by diagnostic equipment. The System Overview, provided by ESI[tronic] 2.0, provides a list of all ECU systems that are communicating in the vehicle, acting as a complete vehicle diagnostic check. This report can be downloaded and given to a customer, demonstrating either what the fault was, or the health of the vehicle once it has been fixed. A diagnostic check may also flag other service requirements which can be dealt with before they become a problem for the vehicle owner, saving time in the long run. The new generation of KTS gives workshops access to OEM solutions without the need to be a franchised dealer. PassThru enables a KTS unit to install and update a car’s internal software – typically the realm of a dealer. A garage no longer needs to purchase several OEM PassThru hardware solutions to cover the range of cars that they are likely to work on, putting valuable OEM data into the hands of independent garages and workshops. ESI[tronic] software ensures that information and processes are available and tailored to a specific vehicle type. The system then provides detailed information on vehicles, including menu tabs for ‘Vehicle Info’, ‘Diagnosis’, ‘Troubleshooting’, ‘Maintenance’, ‘Circuit Diagrams’ (depending on the subscription level) and ‘Equipment’ (parts). These guide the user through all the relevant functions and data that Bosch has for that vehicle, allowing a smooth, personalised diagnostic process. Service related and technical information guides you through the diagnostic procedure. However, if the wrong vehicle is selected by mistake and the diagnostic ECU system is not fully identified, then some diagnostic functions may not work properly. Knowing the vehicle type, drive type, make, model series and engine code can help identify the correct RB code – a unique ‘Robert Bosch’ reference stored within the system to identify vehicles. However, if the device is already plugged into the vehicle, it can identify the VIN details and therefore the vehicle type. The VIN on some vehicles doesn’t contain model-specific information, so the system may require further vehicle specific information to find the RB key and the vehicle-specific guidance. One of the best ways to get the most from diagnostic equipment is to keep it up-to-date. Bosch provides routine software updates which need to be uploaded onto the system by a technician or operator. Online updates for ESI[tronic] 2.0 provide new priority systems coverage and enhancements. As well as the online updates, DVDs are sent out by the company, providing further updates to the system. These also need to be loaded onto the system and provide a different type of update to the online options. With new vehicle technology enhancements and vehicles being fitted with advanced electronic systems, Bosch strives to continually improve the KTS tool and the diagnostic functions and technical information within the ESI[tronic] 2.0 software platform. The Bosch Automotive team employs more than 350 ESI[tronic] software development engineers around the world, working on new diagnostic systems coverage and enhancements for the 180 vehicle brands that are covered by ESI[tronic] 2.0. The UK-based technical support helpline for technicians using Bosch equipment has two dedicated teams that provide help with hardware or software installation queries and technical vehicle problems that technicians may face. In many cases, a quick call to the technical hotline can give the required solution, but if this doesn’t resolve the issue, then raising it on the manufacturer’s online portal may be the best route to receive the right answers. The portal is a direct link to Bosch’s ESI[tronic] service team who look into the suggestions and requests, and investigate any outstanding errors or faults found with the tool. An ESI ticket must be raised whilst connected to the vehicle, which can then be submitted using the ESI[tronic] system. Those purchasing a KTS are offered a free training course within the first three months of purchase, covering the operation of the KTS and ESI[tronic]. Putting the serial number of the product onto the booking form entitles the user to the free session, and will include the basics of operation, as well as how to get the best out of the equipment. For those looking for a more in depth knowledge of diagnostics, the Bosch Diagnostics Technician Programme is designed to give a thorough and comprehensive grounding in diagnosing faults across a range of systems. Hosted either at the Bosch Service Training Centre or regional venues based around the country, a series of sessions is available for technicians to learn about the latest systems and technologies.